世界との付き合い方、世界に対する希望、恐怖、想像そしてアクションについてのエキシビジョン。それがエコロジックである。地球を傷つけずに暮らすため、そして環境、経済、明日を担う子供達と私達自身を守るためのエキシビジョンといってもいいだろう。EcoLogic is a new exhibition about the way we use the world. It’s about hopes, fears, imagination and action. It’s about redesigning the way we live. Translation: Sachiko KurashinaIt’s about caring for our environment, our economy, tomorrow’s children and ourselves – without destroying the Earth. A sustainable future depends upon the choices we make today and every day. Making those choices isn’t always obvious or easy but in this challenging and inspiring exhibition we present new ideas and technologies that can reduce our individual and collective impact on the planet. EcoLogic focuses on what we can do in Australia for the future of the planet and it demonstrates how smart ideas and environmental design can make a difference. EcoLogic will surprise you with its scope. Take a journey through rural and coastal Australia and witness the soil and water crises threatening our food supplies. Meet farmers and communities who are finding solutions to the problems. Find out why a sustainable lifestyle is good for your health and your wallet. For example, these compost worms are fast, effective recyclers. See how clever design whether for a consumer product, industrial system, farming method, or a whole city can minimise consumption of materials, energy and waste. Explore society’s changing values and attitudes to the environment. Walk through our sustainable ‘house’, full of products, energy-efficient appliances and materials that are available now. EcoLogic is a multi-layered exhibition that includes compelling objects, graphics, sculpture and artworks. EcoLogic presents videos, film and soundscapes that bring you face to face with extraordinary Australians who are changing the way we live, manufacture and work. EcoLogic has fun interactives to help explain complex issues, and a play space for young kids. EcoLogic is an integrated program, which includes public programs and special events. Entry to the exhibition is free after general admission. Free Museum entry on the first Saturday of every month. Discount parking available for Powerhouse Museum visitors at Entertainment Centre Parking for $9 (excluding public holidays). 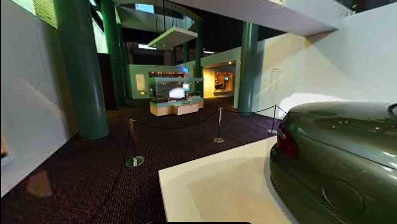 Bring your car park ticket to the admissions counter in the Museum for validation.